My position is that the apostrophe is on the way out. It’s an inconsistent item anyway; it was invented by printers – not grammarians or linguists – and like a lot of other ‘rules’ of punctuation is modified by use. No bad thing. We say as a general ‘rule’ that we use an apostrophe for ‘elision’ (when we leave stuff out) and for possessives (when we want to indicate that someone or something owns someone or something). So when we write ‘haven’t’ – that’s supposed to show we’ve ‘left out’ the ‘o’ of not. When we write ‘Michael’s writing’ that’s supposed to show that the writing is possessed by Michael. He owns it. So far so good. But is all possession marked with an apostrophe? Oh no. So if we use what have been called the ‘possessive pronouns’, its, his, hers, yours, ours, theirs – no apostrophe! Why not? er…well, no one really knows.Look at eighteenth century texts and you will find phrases like, let’s say, ‘the lands were her’s’. Even Mr Strict, Bishop Lowth, the inventor of crap grammar, used an apostrophe there. So, if it was a ‘rule’ then, when did it become a ‘rule’ to not use an apostrophe in, ‘yours’ or ‘ours’? Answer, it’s only a ‘rule’ if you’re the kind of person who thinks this sort of stuff is a ‘rule’ and not, what I would call a ‘convention’. By the way that complicated stuff about plural possessives ‘the boys’ caps’ – meaning two or more boys’ caps only became a ‘rule’ in the nineteenth century. Up until then, people like Jane Austen and Daniel Defoe managed to get by without worrying about it. And in case you’re wondering if the decade was the 60’s or the 60s, the answer is, it all depends on the house style of the whoever is publishing it. Again, it’s a trade matter, not a grammatical one of rules. And if you’re wondering why the possessive apostrophe came in in the first place? Because most nouns used to express possession with an ending ‘es’ with the ‘e’ sounded out. ‘dogges ears’ – with the ‘e’ heard. That sounded out ‘e’ started to disappear just as the first efforts to standardise orthography came in so with the ‘elision rule’ they reckoned that they ought to mark the ‘loss’ of the sounded ‘e’. So it wasn’t a rule of possession after all! It was the old elision ‘rule’. So when you hear people say that the apostrophe is for ‘possession’ as I did all through this article, I was talking nonsense. It was the ‘rule’ of elision but as with vast amounts of so-called grammar and information about language, we believe in the necessity of lying to children – or just foisting our ignorance on to them. That’s because the old idea of ‘investigating language’ rather than laying down the rules has gone out the window. When we focus on rules as they exist in the present without regard to their historical record, they seem fixed rather than emergent. But the near future may show us how short-sighted this is. Rosen argues that conventional usage of the apostrophe is slipping away as we generate more and more text at a rapid pace in the form of emails, text messages, and the like. We are already beginning to see a sort of double standard for formal and informal written language. The difference is not yet as stark as between, say, colloquial dialects and Modern Standard Arabic (the codified version used by college-educated professionals and journalists) but it is growing. There you have it–political change at your fingertips. There are numerous political decisions related to your coffee buying decisions. Heuristics range from the pragmatic (where is closest? what’s cheapest?) to the philosophical (is it free trade/fair trade?). Those are subjects for later posts, though. Over the next week many Americans will be traveling for the holiday season. Whether on the road, in the airport, or in another town visiting relatives, your favorite source of caffeine may not be available. The researchers [Shigehiro Oishi, Felicity Miao, Minkyung Koo, Jason Kisling, and Kate Ratliff] obtained the number of outlets of a variety of chain stores (ranging from Home Depot to Kay Jewelers) from annual reports filed by the companies. Data on how often people move around was obtained from the 2000 census. Using the statistical technique of multiple regression, the researchers looked at the combined influence of residential mobility (how much people move around), median income, and population of each state as predictors of the number of outlets for these chains. They found that the amount of mobility really did predict the number of outlets of chains in a given state. Population also affected this number (not surprisingly). Median income of families was not a predictor of the number of outlets of chain stores. You can find the paper here. An post at Psychology Today has references to further studies on the topic. Behavioral research on perspective-taking provides some explanations for why gift-buying is often such a waste of money. When people try to predict how another person will respond to a certain situation, they begin by imagining how they themselves would respond, and then they make adjustments for differences between themselves and the other person. At both stages, they make big mistakes…. Luckily, behavioral economics provides some straightforward lessons for gift-givers. Don’t assume that other people like what you like. Beware of projecting your current mood onto your purchasing decisions. Avoid unrealistic optimism: People probably won’t react as enthusiastically as you expect. Focus on gifts that will get frequent use, rather than immediate applause, only to disappear into holiday-season purgatory. And unless you are dealing with people very close to you, don’t assume that the gift will matter a whole lot. You’ll probably remember it better than they will. For the last two weeks some of the planet’s most oppressive regimes have faced off against some of the most powerful Internet advocates in an effort to rewrite a multilateral communications treaty that, if successful, could have changed the nature of the Internet and altered the way it is governed. The Internet, and the forces that support the free and open movement of information rolled over traditional UN alliances at the WCIT. An effort to shift governance of the Internet from private bodies like ICANN and IETF was thwarted. The conference did not mark the end of the battle to control what has emerged as the world’s most powerful communications medium. But it very likely marked a turning point. Osorio Chong and President Enrique Pena Nieto have promised to adjust Calderon’s strategy in order to move away from a focus on killing and capturing cartel leaders and toward a focus on reducing crimes against ordinary citizens, most important homicides, kidnappings and extortion. During Calderon’s term Mexico witnessed over 50,000 murders and 25 high-level drug trafficking organization (DTO) leaders were arrested or killed. In the latest draft of a working paper I estimate that this policy was responsible for about 900 additional murders, although this estimate is on the conservative side. Dan Trombly points out that more but fewer DTOs may allow the new administration to treat counter-narcotics as a law enforcement issue rather than a military problem. Although this development occurred after the period examined in my paper, it is an interesting development that deserves further study. Following on Wednesday’s post, we take another look at the everyday politics of commuter trains. Things get serious when trying to find a seat on the London Overground at rush hour–so much so that Brendan Nelson compares it to war. Aspirants – People standing who want to sit down. This includes you. Civilians – People standing who don’t want to sit down, maybe because they’re not going far. 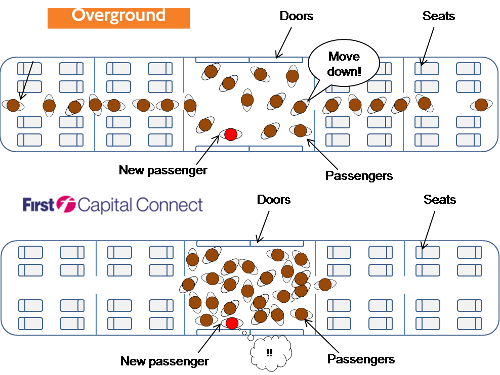 Occupants – People currently sitting down. Don’t be fooled though: they’re still in the game. Don’t take the wrong turn. When you first get on the train you might turn towards the divide in between two carriages. Don’t! This is an unforgiving quagmire. Much like Napoleon in Russia, your campaign will come to a crushing, drawn-out end if you venture here. Get in position–but act casual. Get yourself into the long aisle, where the seats are most abundant. This is the fertile valley of the Overground carriage. But don’t push past people to get here. Try to act casual, like you don’t really want to sit down anyway. As Sun Tzu said, “All warfare is based on deception“. Seem too predatory and you’ll raise the suspicions of other Aspirants, losing the element of surprise. Let them think you’re a disinterested Civilian. Have the seat occupants only just sat down? If so it might be a while before they get off. Can you guess where their occupants might be heading to? For example you can spot BBC people easily (branded building passes, reading Ariel, cooking up ways to irritate the Daily Mail). They’re going all the way to Shepherd’s Bush, so find a new spot. Who else lurks in the same area? If there are pregnant or infirm Aspirants you should move elsewhere – unless, of course, the Overground has completely erased your sense of ethics. Are the Occupants checking the station name or folding up their newspaper? If so then they may be close to departure. Brendan then goes into highly detailed description of the end game–again with excellent graphics. The comments section of his post also has some interesting advice from other commuters who share their “tactics.” His original post is well worth your time if you have enjoyed this so far. My favorite new blog find in a while is that of Brendan Nelson. Like your author here, he admits to “overanalysing mundane topics” but he does me one better–he draws detailed diagrams to accompany his analysis. Today and Friday I will share a couple of his posts about commuter trains to go with the longstanding interest of this blog in the politics of transportation. People who share a regular journey eventually form communities based around shared patterns of group behaviour rather than personal relationships. A well-known example from the Tube can be seen when people boarding the train stand aside to let others get off first – that’s a behavioural pattern that Tube travellers follow, and new travellers quickly learn. Lots of these little patterns exist among commuter communities which, despite being only temporary rush-hour formations, are communities nonetheless. On Overground trains an unspoken rule is, “move down the carriage”. Travellers follow this rule silently – as space appears further down the carriage, people move up to leave space nearer the doors. When the rule is ignored and an unnecessary crush develops, the offenders are loudly admonished – “can you move down please!” – and things soon right themselves. But on the City commute things are different. A train pulls into the platform and there’s lots of space. But then you look at the doorways, and it’s jammed solid – everyone has bunched up near the doors. You think, that’s not a problem; people will move. But this isn’t the Overground. The people in the doorways, already uncomfortably compressed, simply inhale sharply as you wedge yourself in next to them. The train is silent. No-one moves, and no-one is asked to move. This community seems to have a different rule – “don’t rock the boat”. Shouting into the sheer silence would mark you as a lunatic. It’s a powerful rule: I’ve seen people abandon their attempts to board the train, choosing to wait ten minutes for the next one rather than cause a fuss by telling people to move into the empty space. Brendan gives three reasons for these differences, but for that you will have to visit his post. It’s also interesting to see how strong federal systems–the US, Germany–manage to counteract some of these steps. For instance, professional sports teams in the US are strongly identified with particular cities, not states. College sports are more state-centric, but even then the main rivalries tend to be within rather than between states (UT/OU providing a notable counterexample). I wonder whether and how secessionist sentiment is aligned with sports affiliations.